A Short Iron Condor is the reverse position to the more common Iron Condor (or Long Iron Condor). Short Iron Condors are sometimes called Reverse Iron Condors. The key difference between a Long and Short Iron Condor is that with a Short Iron Condor, the Long option is closer to the money than the Short option. The Short Iron Condor is both limited profit and limited risk. Unlike Long Iron Condors, they benefit from Volatility and movement in the Underlying price is required to generate a profit from these positions. As with Long Iron Condors, they are non-directional since both call and put sides can generate a profit if there is sufficient movement to penetrate the Long strike. The Short strike both limits the profit potential and also reduces the risk of a loss. Short Iron Condors can be considered a similar (but more conservative) strategy to a Straddle. 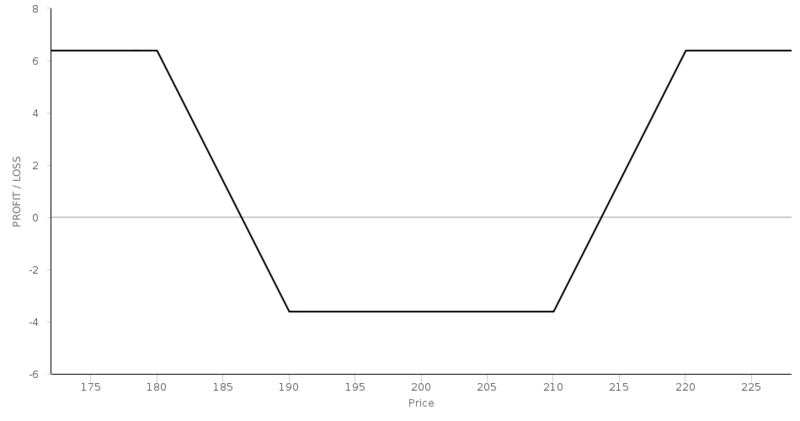 Options Guide article about Reverse (Short) Iron Condors. Optionstrading.org article about Short Iron Condors and when to use them, their benefits etc.